As tomorrow's feasting approaches, I was thinking how blessed I am in so many ways. One of the things I'm thankful for is... YOU. I am honored and grateful that you take some of your valuable time to read this blog, comment from time to time, and in so doing, become part of my community. It takes a village to sound, nurture and hear a voice! Your participation thrills me; everytime I get a comment or new subscriber my eyes light up. Your questions and thoughts help me decide what might be of value to you, and to others. So... thank you all, and may God bless you and yours tomorrow and always. What does a recording studio producer, vocal producer, vocal consultant, vocal arranger, music director DO? Like a commander-in-chief, this is the over-all point person you choose to get your project recorded. You will negotiate a flat fee, an hourly fee and/or for "percentage points" of the sale of your project. Consulting with you about what you want in a final product, as well as helping you understand the process and the costs involved in the kind of project you choose. Assessing who you are as an artist, what your current vocal and songwriting ability is and whether or not you need to increase your abilities with a vocal coach and/or do some co-writing before recording to give you the results you need for your goals. Choosing or helping you choose the best songs for your project and obtaining any necessary licenses for those final songs. Choosing and booking dates for the studio, engineers, musicians & bgvs. Producing the instrumental tracking and the vocals for the songs, or enlisting the services of a vocal producer or consultant. Here is a site with some more great info on what a producer does. This is a member of the production team, who may or may not also produce the instrumental tracks. The vocal producer's job is to get the very best recorded vocal of which a person is capable. This involves not only helping the vocalist sing with good technique but also deliver the song in the most authentic and emotionally compelling way possible, so as to cause an emotional response in the listener. Most of the time, the vocal producer will produce several vocal tracks of the singer and then with the engineer, will "comp", or choose the best of, the tracks for the master lead vocal. This is an in-studio vocal coach who is present to coach the recording artist with any problem areas he or she is having with what the producer is asking. In this case, the vocal consultant is not the active producer at the talkback switch - just standing by ready to help when problems occur. Also known as "BACKING VOCALIST", this person sings a vocal arrangement behind the lead singer. It is a specialty field in professional singing which requires absolute excellence in blending, intonation, subtle tonal color changes and the ability to exactly mimic the recording or live singer's articulation, style and tone. Sometimes an artist does his or her own background vocals if they are good enough at hearing "parts" to do it, but even then it is best to decide if that same voice is what is needed or if a different voice would add necessary texture to the resulting sound. This service is most often associated with background vocals. Unless the project is very complicated, a vocal arranger can usually quickly create the arrangement at the recording session, and is in fact usually the VOCAL CONTRACTOR who suggests and calls the background singer(s) after consulting with the producer. This service is for live performances, including musical theater productions. This person is not only in charge directing not only vocal but also instrumental performances. It's important to discover your vocal strengths and weaknesses because only by becoming aware can you change or keep doing things on purpose that work. As part of an assessment, you should also explore your vocal goals and what it may take to accomplish them. 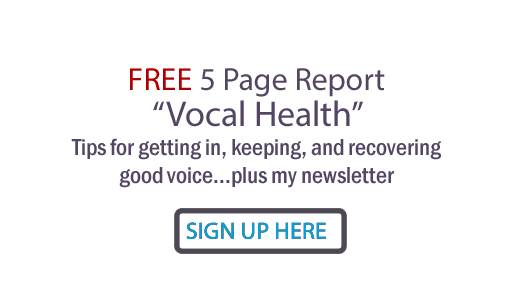 You may need to go to a doctor or clinic specializing in the voice to see if the damage is so pronounced that medical intervention might be necessary or voice rest prescribed before trying to build a damaged voice back to health in vocal training. Some of these problems can be vocal nodes, polyps, paralysis or partial paralysis of the vocal folds (cords). You also need to gain assurance if there is no physical damage, or if corrective vocal training will allow your voice to heal from any damage they find. Damaging habits can and must be overcome by re-training in correct vocal technique. Here's a wake up- screaming for 20 minutes can cause blood blisters on the edges of vocal cords...the beginning of dreaded vocal "nodes"
There are all kinds of muscles which can be strengthened and others which can be relaxed, and body movements that can become much more coordinated for optimal operations of the voice. Breath problems can be overcome; the truth is, it doesn't take nearly as much breath as you may think to sing or speak, if the breath technique is correct. A weak, tight, thin, hooty or voice can, with right vocal training, become richly resonant. Often the person feels they have gained a voice they never knew they had! The psychological and spiritual components that go into effective performance that moves the heart can be drawn out and focused. Vocal training should enable steady progress in vocal improvement, until the person's vocal goals of the are attainable. Vocal warm-ups and warm-downs as well as longer vocal exercise routines should be learned and practiced in an ongoing program. They will support and protect the voice physically by maintaining correct co-ordination between the voice and the body. If a vocalist is working professionally, it is my opinion that they should touch base from time to time with a vocal coach they trust to keep the voice from forming sneaky bad habits which limit vocal ability and can lead to damage. The lessons at that point don't have to be regular, just a check-up with any necessary corrections. Think about it; why did Tiger Woods have to get back to lessons? He stopped doing what worked. But you know what... he's back, and he's bad in a very good way!! For information about my "Power, Path & Performance vocal training courses on cd, go here. For information about my "Power, Path & Performance" personal lessons, go here. I had the great pleasure of hearing Cheryl L. Slay, LLC speak on strategies for indie marketing recently. The event was one of the new "Indie Connect" networking meetings for independent music marketing. Ms. Slay is an entertainment attorney and also a jazz/blues singer/songwriter. She has been very deliberate in charting her own unique course which included moving to Nashville this year and extending the law practice she has enjoyed in Maryland. She markets and books herself, and speaks from first hand experience, both hers and the clients she councils. One thing I really loved: she suggested that each one of us ask ourselves what success means to us. Do we need a label, a major label, or do we just want to sing out some places? Do we want to do music only part time and somehow make a little money at it? Do we actually WANT to play out or do we want to write songs and let others take them on the road? Success can be a terrific MySpace page if we can make as much money as we put into the site. Plan for how you will make money. Most indie artists will need a narrower focus than is presented by the major books on the entertainment industry; business strategies you choose should make sense for your individual situation. You can make money from performance, recordings, merchandise and sales of other services. Often recordings don't make an indie artist as much as the other things - in fact, these days they often are used more to promote the artist than to be the main source of income. Indie artists should run lean, try to eliminate the middle man wherever possible, experiment with different progression of business models. You must stay on top of changes in the industry. Where is the next big thing? Reading such publications as Music Row, Billboard, Variety, Fortune 500, Wall St Journal can help you stay on top of new and emerging business strategies. Set goals with time tables! For instance, one might set a goal to sign with a music publisher in 1 year, get a major cut within 2 years, then cut a demo and begin seeking a record deal the 3rd year. even if the time line changes, Setting flexible goals will get you much farther than just drifting along day to day with no particular end in sight. You must figure out who you are. What is your authentic voice in the world? What do you know that an audience needs to hear? Create an image for yourself which feels right. Perfect your voice, musical and writing skills and physical appearance. Create or find a body of song material that can represent you well. They must have expertise in the music and entertainment field. Their personalities should click with you. They should have connections that can move you forward. If you can't afford an attorney, check out the Tennessee Volunteer Lawyers for the Arts. If you would like to contact Cheryl L. Slay, LLC, visit her website, email her at cls@slaylaw.com or call her at (615) 469-0610. If you'd like to come to the Indie Connect luncheons hosted by Vinny Ribas, go the the Indie Connect website and figure out what speaker meeting you want to attend. You can contact Vinny at vinny@indieconnect.net. The meetings are held at Corkey's restaurant in Brentwood every Monday at 11:00am - 1:30pm. I'll be at some of them when my schedule permits.